Hello everyone! I hope this post finds you all well. The grass is really greening up and the trees are budding out nicely. 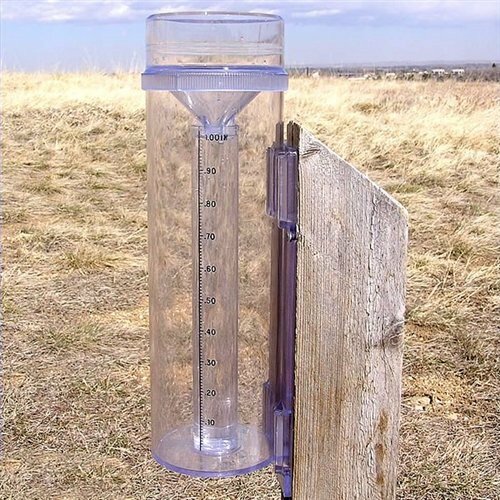 We had rain and thunderstorms this weekend and there 2″ in the new rain gauge. Ah, yes… A new rain gauge. The old one broke so I looked online and locally and was shocked at how much a new one costs. There are all sizes and types adorned with this and that that I wasn’t interested in. I just wanted something simple that I could attach to the railing on the back porch. I found some cheap enough on Ebay so I bought one for $2.42 with free shipping. It arrived in a box from Lowe’s and was definitely shipped by Lowe’s. Inside the box was even a receipt from Lowe’s. I thought that was somewhat strange because I didn’t buy it from Lowe’s. Anyway, it is simply a glass tube that holds 5″ of rain with a piece of flimsy metal holding the tube in place that attaches with a couple of screws to the railing. It will serve the purpose and if it breaks I haven’t lost that much. I had to go to Lowe’s on Friday because I needed a new light for the elevator at church. The elevator at church is, um, very old. If I am not mistaken, this elevator was installed in the early 1980’s and those lights are original A while back one of the fluorescent lights in the elevator burned out. Luckily, Lynn Wilson found one in his garage with the same type of plug. We both knew then if the other light burned out we wouldn’t be so fortunate. Well, a couple of weeks ago the other light burned out. I looked locally and online and couldn’t find one with the same type of plug. The bulb in the old light cannot be removed and the whole fixture needs replaced. The writing on the fixture says GE Light Stick… Just imagine. These lights are about 40 years old and they just now burned out. The bulb is actually glued to the fixture. Anyway, Lowe’s and Menards didn’t have any with that type of plug either. So, I wound up buying one locally and I will have to cut and splice the wires. I couldn’t take photos of the new plants until the next day because it was dark when we arrived back home. I started my plant name research on Plants of the World Online right away. Unfortunately, the Llifle (Encyclopedia of Living Forms) website was not working. Then, the next day POWO wasn’t working either… Three days later they are both working again. GEEZ! Their plant pages aren’t all ready so I have included a link with each one for you to check them out on Llifle if you choose. I thought this Echinopsis mirabilis was a strange looking creature that needed a new home. I think the very dark green color and its odd fuzzy appendages are what caught my eye right off. In a world of cactus where so many look alike, this one is definitely weird. The label says this cactus is a Setiechinopsis mirabilis. HOWEVER, this species was named Echinopsis mirabilis by Carlo Luigi Spegazzini in 1905 (Echinopsis mirabilis Speg.). Curt Backeberg and “ex-author” Th. de Haas attempted to rename this plant in 1940 as Setiechinopsis mirabilis (Speg.) Backeb. ex de Haas. Well, it is back to Echinopsis mirabilis again. When you buy a plant there is only so much a small stick-on label can tell you. This plant actually has more in common with some Cereus species than species in the Echinopsis genus. The flowers open at night and for only one night. The flowers are self-fertile and supposedly produce “hundreds” of seeds per fruit whether they have been pollinated or not. BUT… this silly plant is strangely monocarpic which means it will die sometime after flowering. Fortunately, it will produce several flowers in succession. The fuzzy appendages will apparently lead to more flowers. The one coming out of the top is from an old flower and the dried seed pod is hanging off the end. They flower in ther second year and the plants seldom grow to more than about 6″ tall. This one will be interesting to watch for sure. Click HERE if you would like to see the flowers on Llifle. This species has 7-17 ribs with hexagonal tubercles in vertical rows resembling an ear of corn. It also has a few spines. I like the small leaves and there are remnants of its small yellow flowers. To read more about the Euphorbia mammillaris on Llifle, click HERE. This is the Ferocactus wislizeni (Ferocactus wislizeni (Engelm.) Britton & Rose) commonly known as the Fishhook Barrel Cactus. It was named and described as such by Nathaniel Lord Britton and Joseph Nelson Rose in Cactaceae in 1922. It was first named Echinocactus wislizeni by Georg (George) Engelmann in 1848. The International Plant Names Index (IPNI) says Engelmann’s description was published in Wislizeni Tour North Mexico 96 but gave no date. I looked the name up on the Tropicos website and it says Friedrich Adolph Wislizenus was the “in author” and the description was published in Memoir of a Tour to Northern Mexico in 1848. The tour was connected with Col. Doniphan’s Expedition in 1846 and 1847. Anyway… This plant had a ridiculous “strawflower” hot-glued to the top of it. I was fortunate to be able to find the others without the strawflower. I was able to snip off most of it. I had a similar Fish Hook Cactus several years ago that died not long after I brought it home. I had been looking for a replacement because I really like the HUGE recurved spines. Llifle (and Cactus-Art) have a lengthy description about this plant which you can view by clicking HERE. The species is “variable” and this plant is very small so it will change somewhat with age. Hmmm… Giant Chin Cactus? That is an odd name for the Gymnocalycium saglionis. The label says Gymnocalycium saglione but when I looked the name up on POWO I saw it was spelled incorrectly. Gymnocalycium saglionis (F.Cels) Britton and Rose was named and described as such by Nathaniel Lord Britton and Joseph Nelson Rose in Cactaceae in 1922. It was first named Echinocactus saglionis by François Cels in Portefeuille des Horticulteurs in 1847. Since this plant is small, it has 1-3 nearly straight central spines depending on where you look, and 7-8 recurved radial spines. Llifle says the species has 1-3 central spines and 10-15 radial spines. The felted areoles sit on top of strangely large and globose looking tubercles. The apex is spineless on this plant but that could change. The subspecies Gymnocalycium saglionis subsp. tilcarense has longer spines and larger tubercles than the species. I haven’t seen the species in person, but my plant appears to have large tubercles and fairly long spines. So, it could possibly be the subspecies. The plant can grow fairly large and grows abundantly in protected habitats in Argentina. To read more about this cactus on Llifle, click HERE. This neat little cactus kind of sorta reminds me of the two Parodia lenninghausii already in my collection. As with them, the label had the incorrect genus name, Notocactus. Parodia magnifica (F.Ritter) F.H.Brandt is the correct and accepted name for this species of cactus. It was named and described as such by Fred Hermann Brandt in Kakteen Orchideen Rundschau in 1982. It was first named Eriocactus magnificus F.Ritter by Friedrich Ritter in Succulenta (Netherlands) in 1966. The name Notocactus magnificus was given to this species by Hans Krainz and ex author Nigel Paul Taylor in Cactus and Succulent Journal of Great Britain in 1980 (Notocactus magnificus (F.Ritter) Krainz ex. N.P.Taylor). It’s eleven ribs seem much more prominent than Parodia lenninghausii and its thin spines aren’t quite as long. It doesn’t really make you want to reach out and pet it as much although it is still fairly soft to the touch. I like how the wooly areoles show up well all along the ribs with the contrasting yellow spines. Very nice looking plant. Llifle says, “This species grows in hilly grassland and on walls between cracks in the rocks or in the shade of larger growing plants in deciduous forest. It grows in one of the most temperate regions of the countries with warm and cool seasons and weather can become very cold during the winter nights, often it will fall to just above freezing without harming the plants as it is also very dry. The soil there is well drained and has a fairly high organic content, derived from the decomposition of other plants.” It has a small fragmented range in Brazil (Rio Grande do Sul) Paraguay, Uruguay, and Argentina. Click HERE to read more about this plant on Llifle. I finally cleaned out the Martin house and gave the sparrows their eviction notice. Susie is patiently waiting for a few of them to get into a squabble and forget she is there. I kind of felt sorry for the sparrows over the winter when it was cold so I let them use the house. Soon the Martins will arrive so the sparrows will have to find other accommodations. They aren’t very happy about the situation… I wonder what they are plotting. They have been here for a few weeks now and it has been OK for the most part. Their sleep schedule is worse than mine, though. Basically, they have none at the moment. At first, I had to get used to someone being up and sometimes in the kitchen in the wee hours in the morning if I needed a snack. Old habits are hard to break especially if you enjoy those old habits. I have been told to lead by example. GEEZ!!! That is about all I have to talk about now. OH, WAIT A MINUTE! There is one more thing I almost forgot! A few days ago I noticed this little shoe sitting on the floor of the back porch. I had never seen it before so I asked Nathan and Chris if they had noticed it. They said they did but we all just left it there. It was odd to me because It reminded me of another shoe I had found several years ago in the strangest place. I was on a ladder at the mansion in Mississipi cleaning a light fixture. The fixture was hanging from a chain next to the stairs across from the dining room. The shoe was on top of the light. I left it there hoping that someone would find it after I left and also find it odd. I don’t remember the color but this shoe definitely reminded me of it. Hmmm… Makes me wonder where this shoe came from on the back porch. Could it be? Now I am finished. Until next time, be safe, stay positive, take a deep breath of spring air (if you are where it is spring). I’m thinking that…… instead of buying a Cacti book last year, i should have just scanned your images in each post to find the names of some of my old Cacti photos from the Royal Botanic Gardens 😀 I still haven’t finished the task of identifying each Cactus plant (photo) in my archives. You sound like the only other person I know who likes everything exactly in its place. Exactly in my home means to the nearest 1/4″. My excuse is that I can’t remember where I put things if someone else moves them. Same with my fridge. Everything is placed so that I can see at a glance what is running out and what shopping needs to be done. Hello Vicki! Cactus ID is not easy even though look at hundreds of images. So many species look alike and are variable. If I can’t figure it out I send the photo to someone or post on the Facebook group. Even then sometimes I wonder. The only way anything ever stays in its place is if you never use it or you live alone. I am always using something and not putting it back but I usually remember where I used it last. Nathan always says he is the same way… NOT! 🙂 Now there are two… 😐 Thanks for the comment as always. You should see my rain gauge. https://images-na.ssl-images-amazon.com/images/I/61IWIOrn5mL.jpg It will hold up to 14″ rainfalls. I’m a weather spotter and like to report rainfalls for the weather service. This one is accurate to hundredths of an inch. The ‘boys’ looked comfy on the porch. Looks like they might be taking over your premises. Hello Jim! Nice rain gauge! I had one in the barn that is much bigger but I couldn’t find it. This makes the third one I have put on the back porch. The others were “vintage” John Deere gauges dad had before. Anyway… I am pretty sure the “boys” aren’t interested in taking over. Actually, that would be a good idea. Thanks for the comment! P.S. I have seen vultures here this past week but I can tell if they are Black Vultures or Turkey Vultures. I haven’t been able to get close enough to tell. The Turkey Vultures are more common in this area but the ones I have seen don’t appear to have red heads from a distance. The Black Vultures are expanding their territory. It is fairly easy to tell them apart, even by the way they fly. I will have a closer look this week.